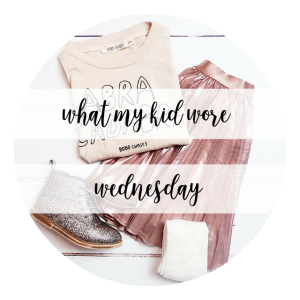 What my Kid Wore Wednesday | #6 | Merin and Co.
It’s that time of the week again! Time to join #whatmykidwore, the kids fashion linky hosted by Sarah, @Thismamalife. Socks: Next. Size 3-6 months! Top: Next. These stripes are so lovely and the material is so soft. I definitely feel like this top is making him look more like a little boy than a baby! I do think its lovely though and definitely good for the winter! Dungarees: Next. Yep, we are top to toe in Next today. I absolutely love these dungarees. The little dog on the front is far too adorable and the little pocket at the back is another super cute detail. Slippers: Next. The bunny slippers are my absolute faves and it breaks my heart that he is getting too big for them. I feel like there may be actual tears when the time comes. This is another comfy, cosy outfit for Heath. I now need to find a dribble bib to match! We already have so many but not one that matches perfectly. The question is…should I go shopping for bibs again? I love this outfit as Heath looks smart and cute all at once. My little boy is growing up before my eyes and I can’t believe it! Before I sign off, can we just talk about the bunny slippers again? They really are the most adorable things!